Krishnakant, IRM: As all our articles in this section, the one below has also been first published in the IRM’s official magazine Back To Prabhupada. BTP is being distributed for free to ISKCON devotees and people interested in Srila Prabhupada’s teachings worldwide. If you would like to receive BTP at your home, simply send us your full name and street address via the following email address: irm@iskconirm. com. Supporters of the ISKCON Guru hoax claim that the representational initiation system instituted by Srila Prabhupada on July 9th 1977, whereby he would initiate all future eligible members of the institution via the use of priests (ritviks) acting on his behalf, was only set up as a temporary measure. In the first issue we reproduced the original directive, signed by Srila Prabhupada, where there is no mention that the ritvik system was just a temporary measure for ISKCON. The only indication of the directive’s duration is the word ‘henceforward’, which simply means ‘from now onwards’. 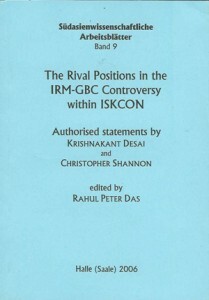 It is interesting to note that at around the time of the July 9th directive, several other letters concerning the ritvik system were issued by Srila Prabhupada’s leading disciples whilst acting in an offcial capacity on his behalf, and not one of them gave any hint that the ritvik system was only a temporary, stop gap measure. We also have no words in any letter or document of that time that give any notion that the ritvik system was just a short term measure. There is no statement from Srila Prabhupada that even hints that this system was to terminate on his departure. Rather, as we saw in the last issue, Srila Prabhupada’s Last Will and Testament stated that whatever was running in ISKCON at the time of Srila Prabhupada’s departure “will continue as it is now” and “there is no need of any change”. Hence the convergence of all the evidence says just one thing: the ritvik system should still be running within ISKCON.